Get stunning glamour with this 18ct white gold bridal set from Perfect Fit. Comprising of a beautiful sapphire engagement ring with diamond halo and diamond set shoulders for sophisticated shimmer, and a dazzling diamond set wedding band for endless sparkle. 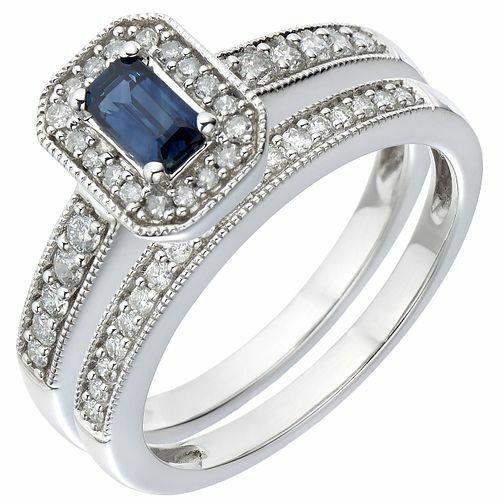 18ct White Gold Diamond & Sapphire Perfect Fit Bridal Set is rated 5.0 out of 5 by 1. Rated 5 out of 5 by Anonymous from Of course I said yes! I chose this ring months ago, it had to be my engagement ring! I’m absolutely in love with it and I can’t stop looking at my hand.